There's a deep sense of satisfaction and delight at this stage. I'm in awe of so wonderful our God that He deigns to bless me with a tiny corner of His Creative Self. All glory to Him! 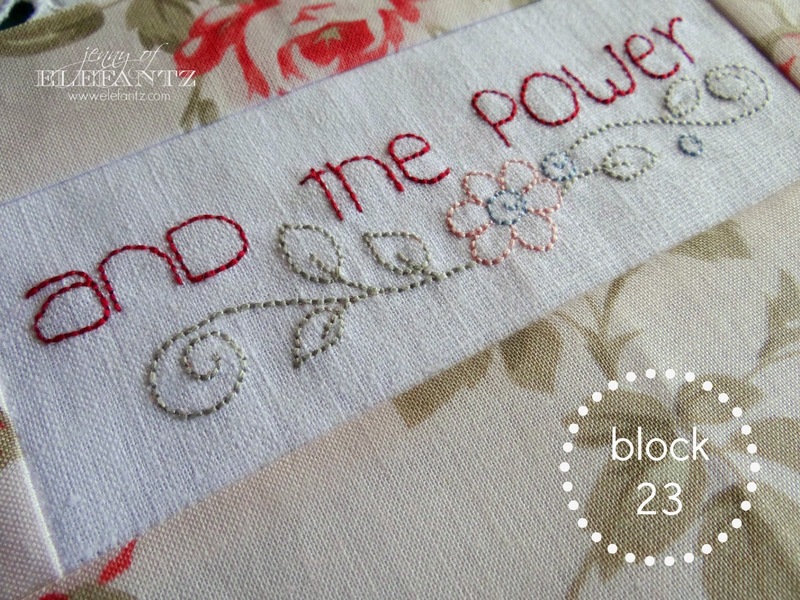 ...and because Christmas is fast approaching, and some of you may be stitching the Lord's Prayer Quilt as a gift, I've decided to share all three remaining blocks as a single download next Monday so you can complete the quilt a little sooner. Well, maybe not actually famous, but kinda-sorta because Allie Hartom of Allie-oops Designs has just released her newest stitchery and it's a gypsy wagon that she named after *me*! Jenny Rose - isn't she gorgeous!? I can't wait for a little down time to stitch it! Kind of a 'self portrait', yeh? The quote under the wagon is from "Lord of the Rings" and is Blossom's favourite line from the trilogy - she even wears a silver ring with "not all who wander are lost" engraved around it. 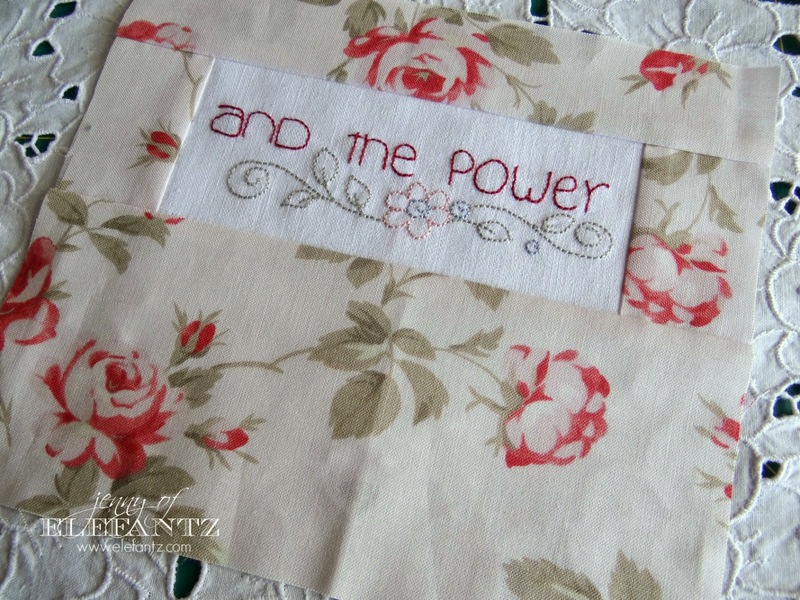 But sadly for Blossom, when I stitch this design of Allie's it will be staying with me. 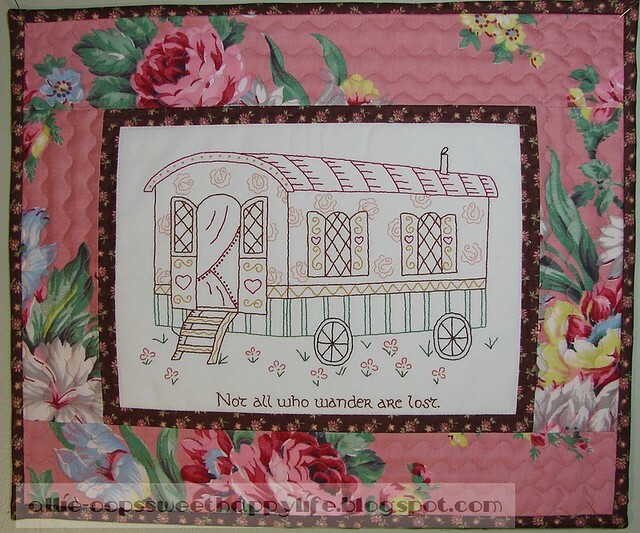 If you want to stitch Allie's 'Jenny Rose Gypsy Wagon' her pattern is a pdf download over HERE, and you can drop over here to her blog and tell her how much it looks like me, if you like. I was thinking they'd be perfect for new cushions, or maybe a bag - well, anything really! Now all I need is a free day for myself to play. I shall endeavour to do so and keep you posted. 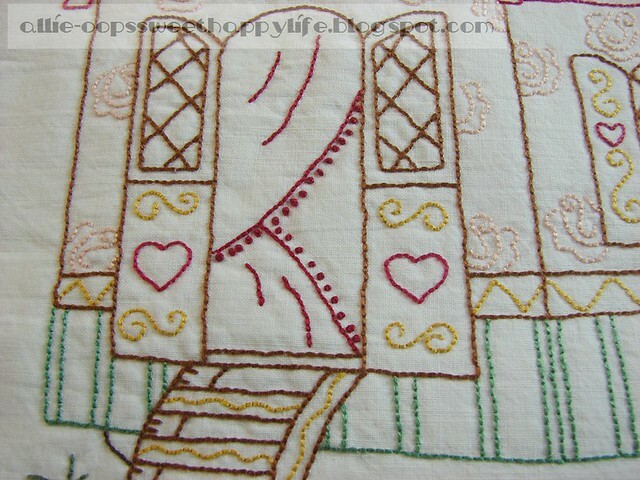 Have you made any fabric windows yet? She is beautiful Jenny - your own gypsy wagon for more weekend journeys I'm thinking! The Lord's Prayer looks lovely with stippling. Can't wait to see it all finished and hanging. Congratulations, Jenny, a very sweet pattern to have named after you. 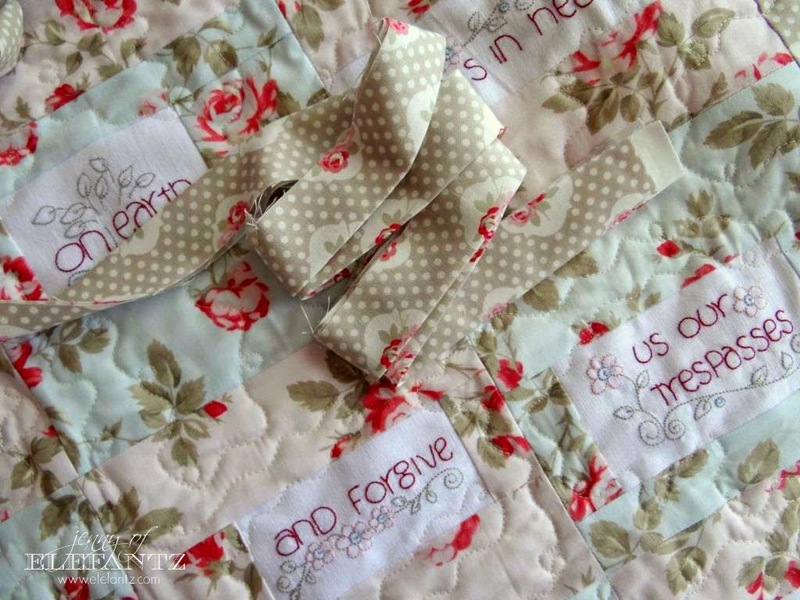 Oh my gosh Jenny the Lord's prayer quilt is my favorite thing you've done - well, except for your Promises and Borders, and Shabby Roses, and and and....I'm just dying to start it. 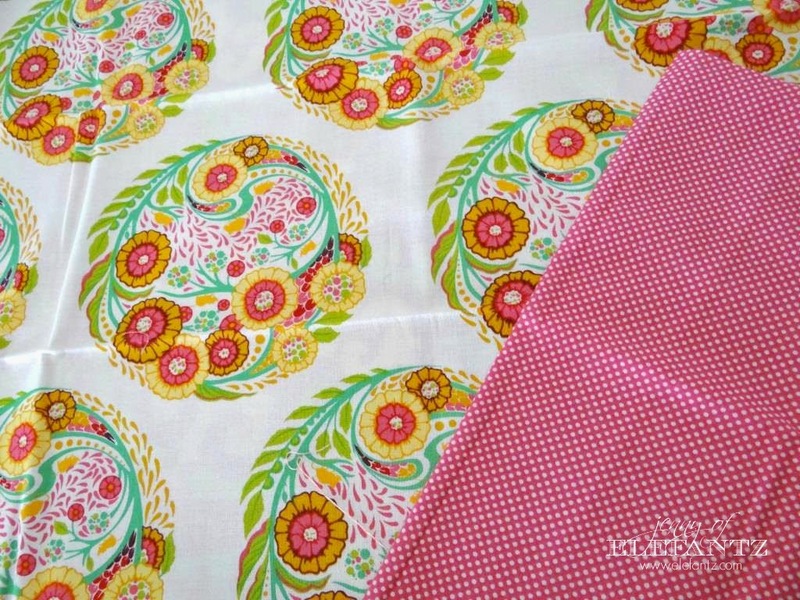 I'm going to finish Daisy Days first though, my project box is so heavy with all the fabric I've picked out for it, lol! It used to be that I never saw a rose without thinking of my beloved grandmother. Now, I think of her AND you. So the Jenny Rose is totally appropriate. It hangs on my wall and reminds me to pray for you all day long. I hope you get a day to play soon - those fabrics are gorgeous! How gorgeous is that wagon of Allie's! You must be excited having it named after yourself, Jenny. If does any good, you are pretty famous among my students and my followers in the Ofício da Agulha fan page. Sad that is only in Brazil, but people in my corner know that I think you have the best backstitch in the world! A very nice week for you and the wagon is very cute! Ahhhh a wild gypsy! I can picture you as a child of nature :) Beautiful stitching as always and I do hope that you find the time to play so we can all enjoy seeing what new wonders you create! 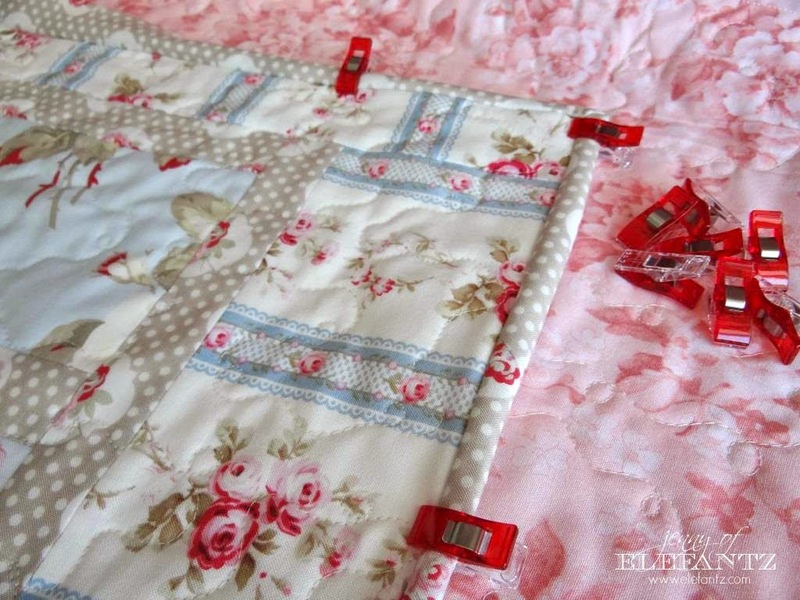 Love the color of this quilt, and your embroidery, great post! I've hardly had any time in the sewing room this week, so no, no fabric windows yet. I saw that design on Allie's blog and thought how special your friendship is. I think it's love that she sees you that way. It started me thinking all over again about getting back on the road. LOL Not in a vardo, though. 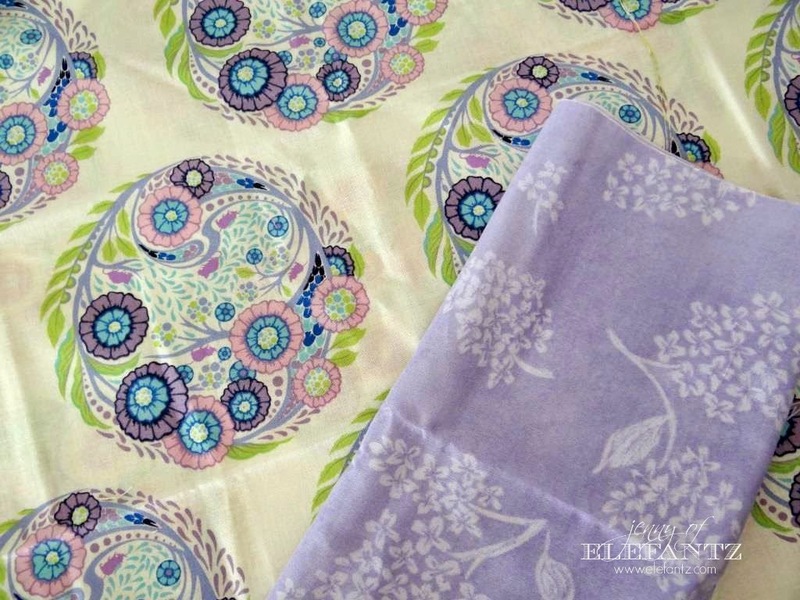 Your fabric stash must be so much fun if you could find those two circular patterns in it!